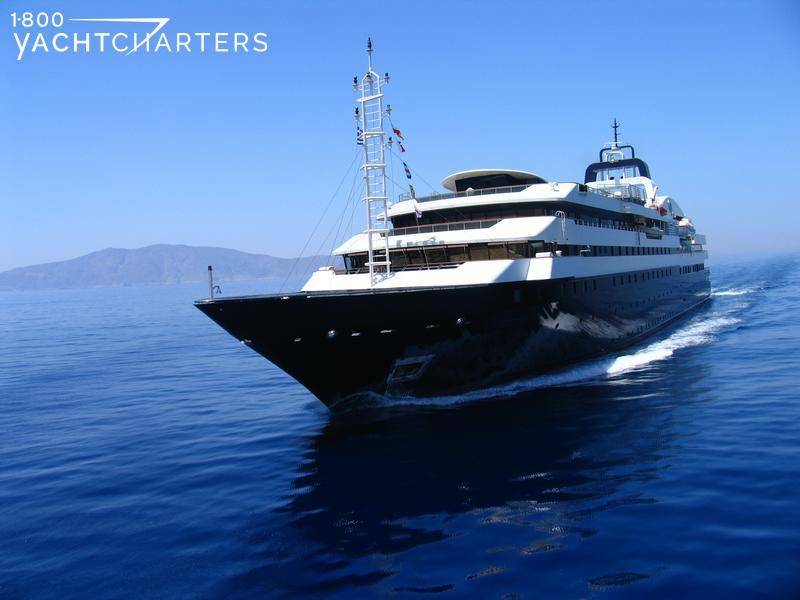 For large groups seeking a Greek yacht Charter, motor yacht TURAMA is an outstanding vacation option. 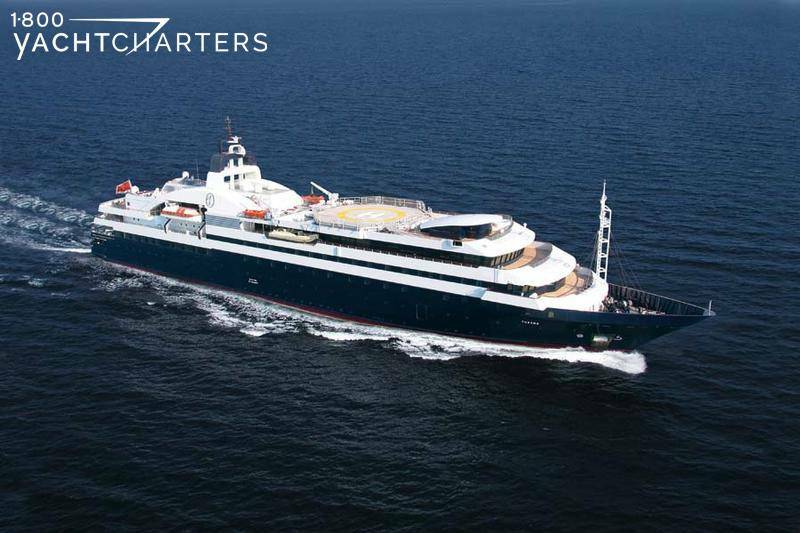 Originally launched as a passenger ship in Finland, the 116 meter vessel was converted into a luxury yacht and now accommodates 60 to 70 guests, and is consistently ranked in the top 10 among the world’s largest converted super yachts. Grand entertainment and corporate hospitality now define yacht TURAMA, now a staple among the Cannes Film Festival yacht charter vessels that congregate every spring in the South of France. 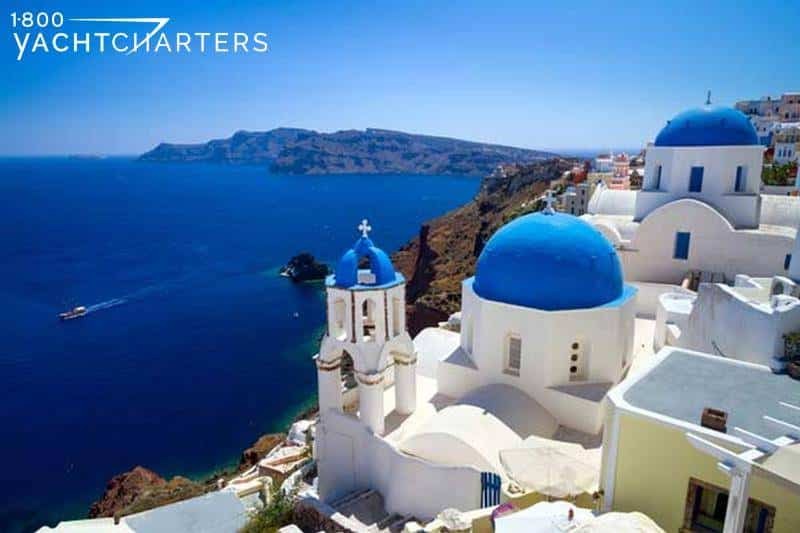 At the conclusion of the festival season, the yacht returns to Greece for the summer. 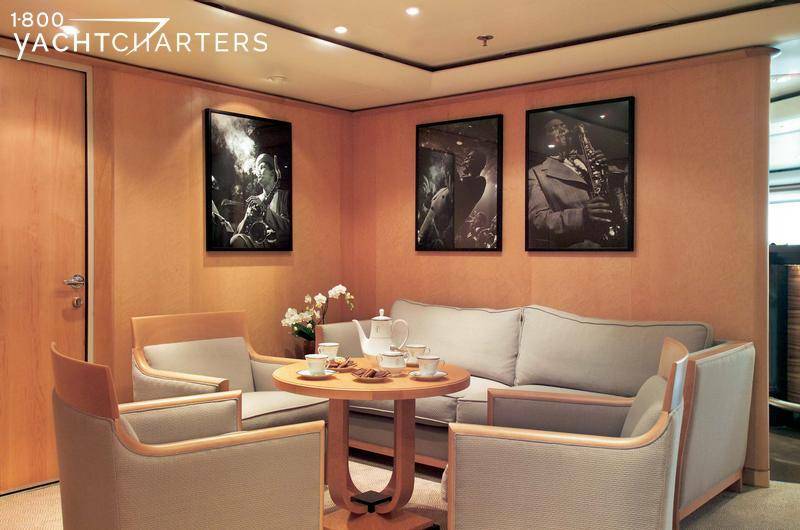 The contemporary décor creates a feeling of light and space throughout the interior. 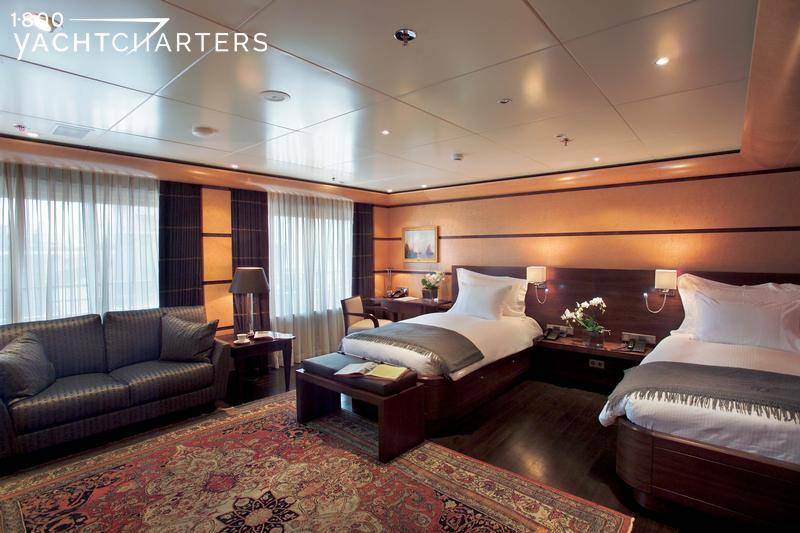 The guest cabins are tastefully furnished and include a master suite with King bed, 16 Queen-berthed starerooms, 16 single berth staterooms, and 10 twins. 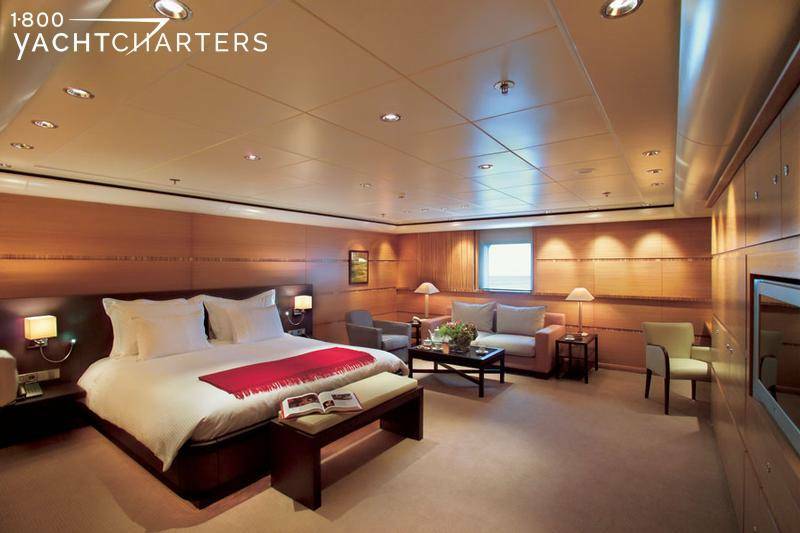 Each cabin features state of the art entertainment systems and well-appointed bathrooms ensuite. 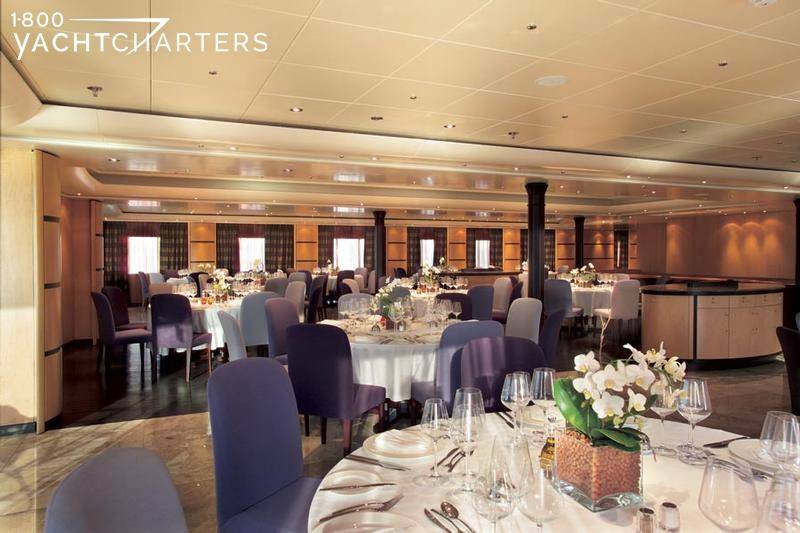 Dining options include a formal dining room with seating for over 100 guests. For relaxed alfresco meal service, the aft deck is perfect for breakfast and lunch. Enjoying cocktails at the open air Long Bar is an idyllic spot to socialize and entertain business associates, while the piano bar is the recommended after-dinner retreat for an espresso or cordial. 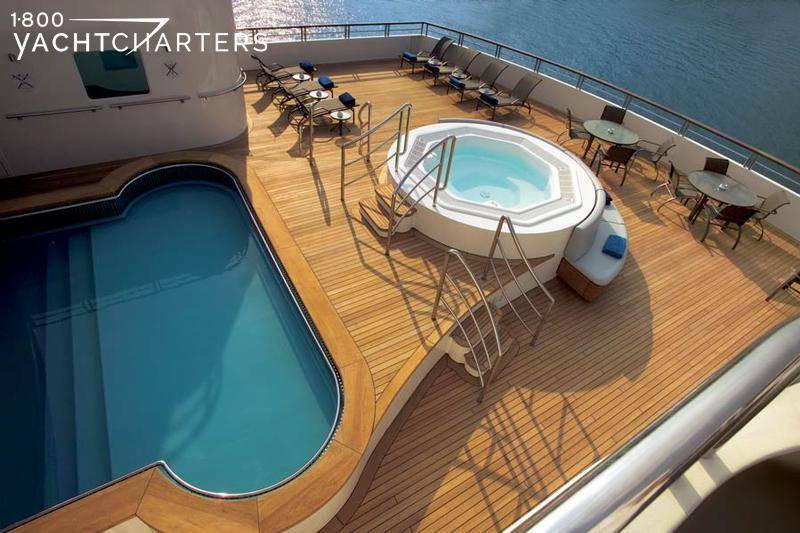 Active guests will enjoy the on deck swimming pool, sun decks, and two Jacuzzi style hot tubs. 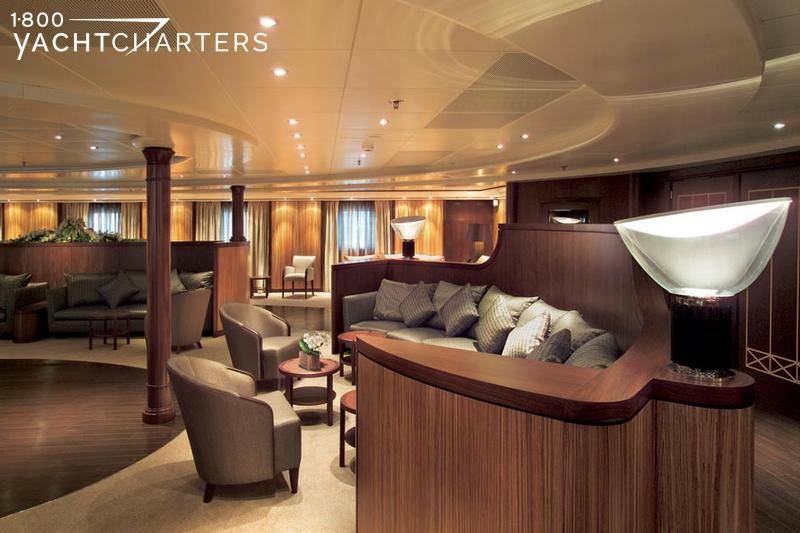 Completing the Wellness yacht charter environment are an indoor gymnasium, sauna and spa. 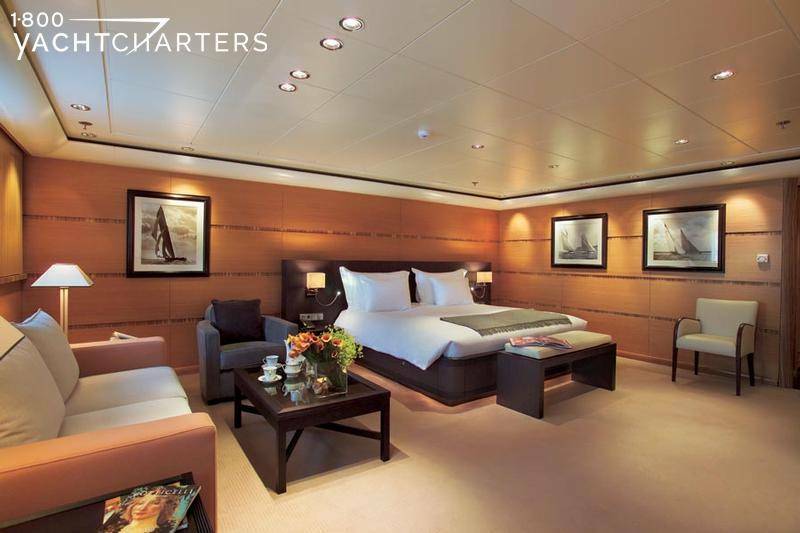 The 384 foot yacht is perfectly sized and equipped for special events. 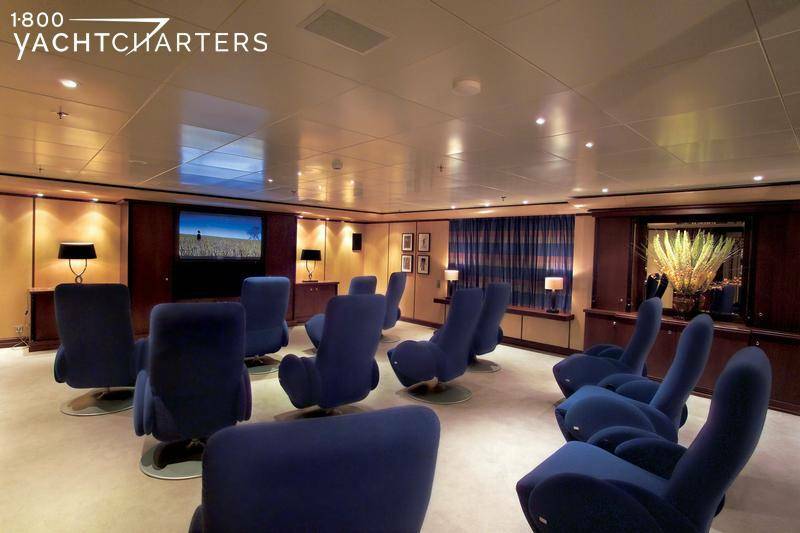 There are large conference rooms, comfortable meeting rooms and spacious public entertainment areas. 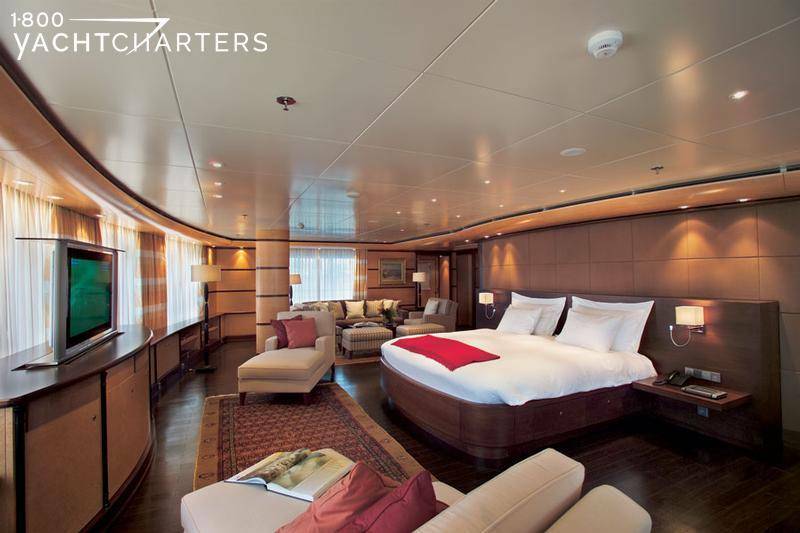 A fully certified helipad made be used by charterers, to shuttle VIP guests from ship to shore in comfort and privacy. 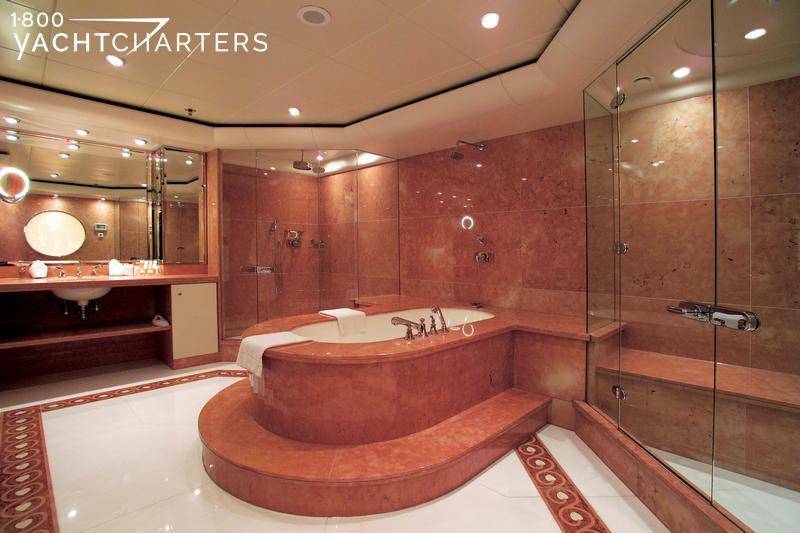 Turama is one of the Top 100 largest superyachts in the world, and she’s one of the Top 10 largest converted superyachts in the world. Please note that Turama is temporarily unavailable for charter, but please contact us, as we have many other superyachts available for you!